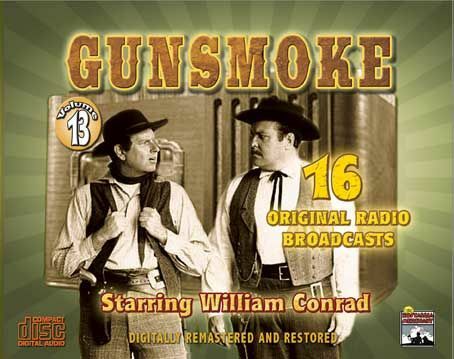 Here is Gunsmoke Volume 13 starring William Conrad as Marshal Dillon and Parley Baer as Chester. Chester’s character had no surname until Baer ad libbed “Proudfoot” during an early rehearsal, and Chester was born. The amiable Waco expatriate was usually described in the scripts as Dillon’s “assistant”, but in the December 13, 1952, episode “Post Martin,” Marshal Dillon described Chester as his deputy and that was that! Snakebite – 8/12/56; Annie Oakley – 8/19/56; No Sale – 8/26/56; Old Pal – 9/2/56; Belle’s Back – 9/9/56; Thick-N-Thin – 9/16/56; Box of Rocks – 9/23/56; Brothers – 9/30/56; The Gambler – 10/7/56; Gunshot Wound – 10/14/56; Til Death Do Us Part – 10/21/56; Dirty Bill’s Girl – 10/28/56; Crowbait Bob – 11/10/56; Pretty Mama – 11/11/56; Brother Whelp – 11/18/56; Tail to the Wind – 11/25/56.